We were very interested with the LEAP motion controller and wanted to do a project to showcase its functionality. From there, we wanted to create a robotic hand to reflect the motions of the user's hand. Due to the time constraints, we only had 1 motor running but added some extra flair with an "Iron Man" pulse reactor/glove. Takes input from the leap motion controller and displays it on our hand. Currently shows wrist rotation as well as the pulse when the hand is fully open. We started with trying to get input from the LEAP motion controller. Once we had that working, we branched out with Steven working on fabricating the hand as well as working on the LED and helping out in troubleshooting. Meanwhile, Hankle was working on getting the Arduino working to control the motor as well as LED and wiring it all up. 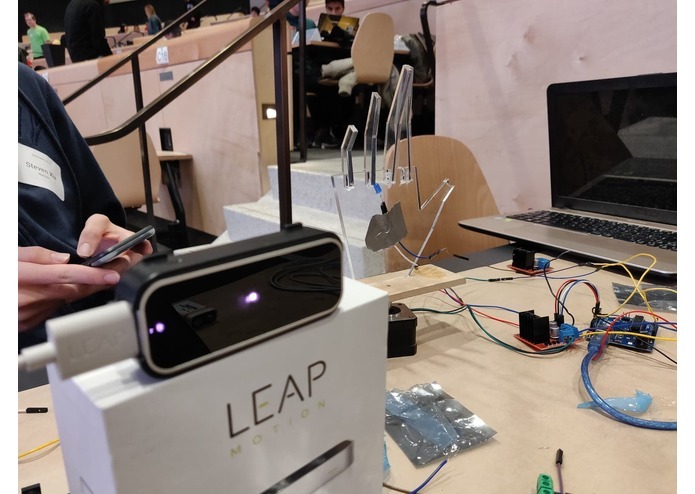 Peter worked on refining the LEAP motion input and generating an output from that program that can be then read by the Arduino. The main challenge that we faced was getting the transfer of data from the LEAP motion controller to the Arduino. We eventually figured out that we were opening and closing the Serial file way too quickly where the Arduino would continue to reset and therefore not read anything. We also had problems with the step motor where it wouldn't work. There were a variety of problems we had with it including the motor driver, power delivery and signal control. Getting something that worked is pretty amazing! It was also really cool to get the whole data path working, from free-movement in space to a mechanical motor and LED. We learned a lot about Arduino, LEAP motion and troubleshooting. It was also amazing to learn everything that the LEAP motion tracks such as each individual bone in the hand and its length and position. Iterating on the design by adding more motors so we can actually mimic the movements of the human hand.